Three months ago, I posed for my college graduation photo — the official one in front of an American flag, diploma in hand, ready to face the world. Since then the photography company has emailed me almost weekly, offering discount upon discount and before-it’s-too-lates. But when the picture was taken, just seconds after I had crossed the stage and shaken hands, I was too delirious to smile, so instead I bit my lower lip. I mean I almost swallowed it. I don’t know how it happened. Normally, I have no trouble smiling. But I remember at that moment that the muscles would not contract into a casual, triumphant smile, that my lower jaw was literally shaking with some kind of dread or excitement or panic or all of those things, and to control it — literally, to stop the shaking — I bit my lower lip. In a big way. The photo is commendably awful. If the discount gets steep enough then I’ll buy it and take it out whenever I need to take myself less seriously. But another photo of me on graduation day — May 23, 2010 — was, in conventional modern Internet terms, a huge success. There was a moment on the day I graduated when, bored by the endless procession and also nursing a pulsing hangover, I looked away from the crowd — basically at nothing. It was at this moment that a photographer seemed to spring into my line of vision, and I heard a snap, and I broke my gaze to catch him darting away again. I was vaguely aware that he had taken my photo. I was more aware that I was wearing a polyester black gown in ninety-degree heat at ten in the morning. A few days later that photo showed up on the Internet on a popular news blog. It was credited as a Getty image. A lot of people sent me the link. The photo was unexpected for a number of reasons; most disturbingly, in that bored, brain-pounding moment when I glanced mindlessly at the five-piece brass band playing the processional, I had somehow managed to look thoughtful. I am looking away from the crowd, away from my classmates who face forward and smile and rejoice in the moment, and I am looking somehow self-satisfied and also positively uncertain of myself. I also look tired. Worn-down. As if I’ve had enough. Is there anything more pathetic than unintentional poignancy? 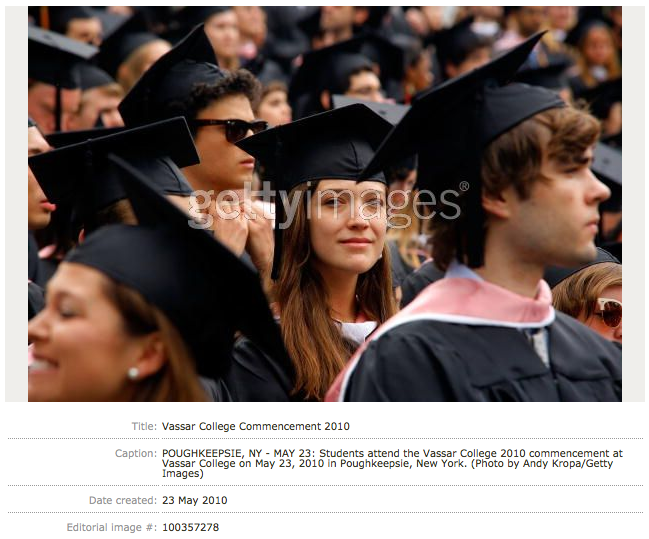 After that first posting, the photo continued to surface, mostly in a handful of articles about the recently graduated class of two thousand and ten. The articles were all about how nobody in this graduating class would get hired for a long time. CNN reported it. The Atlantic reported it. The Huffington Post reported it. We were all destined for unemployment and my face seemed to say it best. Hungover and under-prepared, but I could fake contemplation and self-awareness with the best of them. My friends declared me The Face of An Unemployed Generation. I received emails with links embedded, a quick note attached: “Hey Emma, you’re famous! Hired yet?” It was fine; it was funny. My father tracked down the photographer who took it, the springy guy, and talked him into mailing us a few copies without the expensive Getty costs. My grandmothers were thrilled. The Getty photo has now made it to my parents’ piano top, suggesting that is somehow iconic, affecting. It’s not right. The iconic photos I know best — my parents wrapped in a blanket on a porch in Vermont at age 22, laughing and hugging and dotted with sunlight — are from a time when film was developed and intensely personal and usually in black and white. This picture, the brass-band gaze picture, is hyper-modern. It is digital, high-quality, licensed, recycled, stock, somehow representative. And most of all, a fluke. The image that really has stuck is not even necessarily one of me, but of many others-the same way my parents on a porch in the seventies is probably the image many of my classmates have of their parents on a porch in the seventies. In the two-week waiting period after my very first job interview after graduation — a period in which I over-analyzed my every misplaced word and nostril-scratch — I remembered with a terrified jolt that before it had even begun, before I had crossed my legs and folded my hands in my lap and smiled expectantly across a desk with neatly stacked papers, the very first image I gave a potential employer was of me, pulling on a pair of locked glass doors. I was wearing safety-pinned pencil skirt and a borrowed blazer and I had three copies of my resume in the canvas bag on my shoulder. The woman at the elevator bank twenty floors down had wished me good luck and told me I’d do fine. I got off the elevator on the twentieth floor of the Manhattan skyscraper, I walked to the doors, and I pulled. Then, I pushed. The doors did not move. The man in the suit came forward from where he stood waiting for me, beyond the doors, and opened them. Of course. The doors to corporate America were locked, and I could not get in. I am the cliché in action. When I reached out to shake the man’s hand and smile confidently — I know that I bit my lip. Click. Emma is moving from Vermont to Brooklyn to better blend in with the rest of her unemployed peers. She sort of wishes she were on Twitter. The photo of Emma Carmichael above is by Andy Kropa, licensed through Getty Images.